These events are true and happened as reported without any made up parts. Part one of yesterday was a doctor's appointment. If you are female, live in the tropics and get sweaty gardening or doing other physical things or if you swim in the ocean a lot you will get yeast and bacterial infections. Period. Not a real problem. I called 6 different gynecologists to try to get an appointment. Only one office talked to me and said the doctor spoke "understandable English." I was told to come in at 12. I drove to Aguadilla and arrived at 12. I parked and went to the door and it had a padlock on it. They open at 1. I sat in the hot truck (there is no where else to go for that amount of time) when boom...the parked truck is bumped from behind. I honk the horn. Then I got out. An old guy, in his 60's, finally got out to inspect HIS car. I told him he pushed mine (in Spanish of course). Nothing. He wanted me to move up and I did not since I did not want to be boxed in. He jostled the car around so it was partly up the curb (it was a nice-ish car) and then proceeded to break all the branches he could off a tree (with his hands) so the branches wouldn't touch his car. I told him this was not very nice, first pushing my truck and now breaking some one's tree. He left. I put all the branches he broke off under his wiper blades and later (I was still waiting) saw him pull out and drive off with them! Now I see the office is open. I am hoping to wait inside. I see the doctor drive up so I go in and give the office gal my health card etc. I fill out all the Spanish forms and then ask where I am on "the list." I am third. I explain I was told to come at 12 and asked why they would tell me noon when they close at 12 for lunch? I explained how I had been sitting in my car for an hour. They were nice and made me first and the guy did speak "understandable English" and my problem will hopefully be taken care of. I was asked all the usual medical history questions PLUS "what is your religion?" (my response was "private.") In the States they have microscopes so you know on the spot but here you wait for lab work. I was excited to be done and it was early in the day so I decided to go get the "health certificate" so next week I'd be ready to spend the week at CESCO (like the DMV) to renew my driver's license. I looked for the place I went to 5 years ago and it was padlocked so I went into CESCO to pick up forms and try to get some guidance. Our bills are in Jeff's name so I knew this was going to be a problem. I have bank statements with both our names but they don't have a physical address on them. I am wondering if it will take less time to go to a lawyer and get an affidavit that says I live in my house. The information desk has 10 or more people blocking it filling out forms and one person who only speaks Spanish (or so she says) but then the ANGEL appears! A security guard calls me over and in Spanish asks me what I am there for. I tell him in my mangled Spanish and he speaks English! He asks me if I have 1) old license 2) birth certificate (copy), 3) passport (copy) 4)social security care (original), 5)marriage certificate 6) power bills and 7) water bills, 8)husbands driver's license (copy). I show him the water and power bills and how Jeff's name is on them and oops there is a problem. Soooo...the angel tells me to go next door and get a health certificate and 11 dollars worth of stamps, get a signed note from my husband saying I live in the house with him (wink wink - write it on the water bill and sign it for him), get a number at the photo window. I get the number first because there are lots of people there. 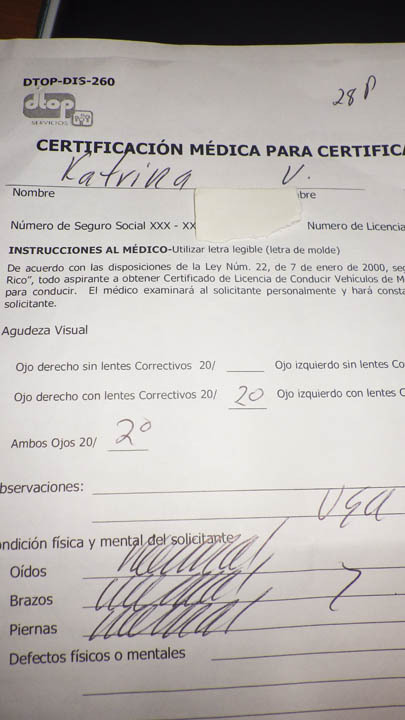 I get the certificate without any problems because as you can see on the form I hear and have arms and legs. I look over the counter and make hand signals about what direction the "E" is in, pay my 28 bucks and go back next door. I ask a person what number they are on and it is 71! My number is 70 so I run up and toss all my stuff in the window before 71 gets there. She looks at all the papers with the usual name confusion (passport doesn't match birth certificate) so I show the marriage certificate. Our bills go to a PO Box but shows my and Jeff's name on them. The bills are not two months in a row but oh well. She wants xeroxes of Jeff's license, birth certificate, passport, she has to have the original social security card (momentarily lost when she dropped it on the floor in the mass pile of papers). A second person has to join in and she handles it, takes my photo, tells me she'll make copies and meets me at another window to direct me to another line. I go there not knowing what to expect (except to wait) and there are 4 people and 3 at the windows. He looks everything over and tells me to stand over somewhere else. 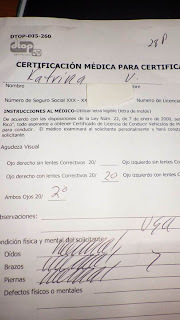 Then I am called up and handed my blurry new license with my brand new address - San Sebastian. All my papers (a lot) all were proof that I live in Moca but for my final time in Puerto Rico I guess I am from San Sebastian. This was the most efficient I have seen government here - I was done in around 32 minutes from info desk to truck. I often wonder how much speaking Spanish helps. I have had a few occasions where I was lost (by myself in english) and getting nowhere. When Cassie shows up and starts the conversation in Spanish, the tone changes and things happen. I can understand this as I have a hard time understanding what someone wants when they approach me in Spanish. Which is why I am taking the spanish classes to try and help me with that, but it will still be years before I make any real progress. Nothing wrong with PR spansh, the same language spoken in Mexico ,Spain and USA the only difference they sound little different.